* Made of high quality water resistant canvas material, fashionable and durable. * This women backpack can provide enough space for your items, including 1 main compartment with 1 interior zipper pocket and 2 interior slot pockets (for wallet / makeup / IPad), 2 side pockets (for water bottle / triple folding umbrellas), 1 front zipper pockets (for keys / tissue / charger). * Water resistant material keeps your items from not easily getting wet and gives good protection for your essentials. * The lightweight and fashion backpack can be used as a school rucksack, travel daypack, shopping bag and etc. * Size: (L) 12.60 x (W) 6.30 x (H) 12.60 inches, fits up to 9.7" iPad Pro, tablet or a laptop 10" and under. 1. Oxford nylon fabric has natural smell, but it will disappear in a few days exposed to outside. [HIGH-END MATERIAL]: Made of high-quality water resistant canvas material with mental buckles and zippers, which is fashionable and durable. [PRACTICAL STRUCTURE]: 1 main zipper compartment with 1 interior zipper pocket and 2 interior slot pockets, 2 side pockets and 1 front zipper pockets. Multi-pockets could fit your 9.7" iPad Pro, tablet or a laptop 10" and under, cell phone, umbrella, water bottle, house keys and other tiny items. 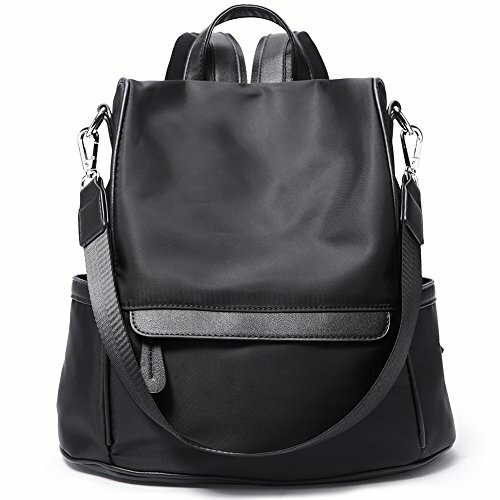 [WELL-DESIGNED] You can carry it as a single-shoulder bag or backpack as there is a removable short shoulder strap. Water resistant backpack keeps your items from not easily getting wet and gives good protection for your essentials. [DIMENSIOIN & WEIGHT]: (L) 12.60 x (W) 6.30 x (H) 12.60 inches, 1.16 pounds. Note: This bag is not suitable for any laptop that is larger than 9.7 inch.